Universal Joints are used throughout industry to allow for large amounts on angular misalignment. 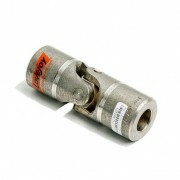 We supply universal joints from 2 different companies Lovejoy in the USA and Marrio Ferri in Italy. The Mario Ferri universal joint is a very versatile universal joint with a maximum speed of 1000RPM and a maximum angle 45º with the E type and 90º with the ED type. 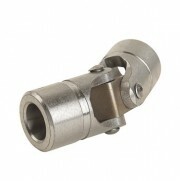 A standard industrial type universal joint with pin and block design, the ‘D’ type is ideal for applications with up to 25° angular misalignment and speeds up to 1750 RPM. It is available unassembled with no bore, or assembled with a pilot bore. Protective rubber boots are available to ensure proper lubrication for up to five times longer universal joint life. The ‘HD’ Type is a high quality universal joint made to exacting tolerances, perfect for your toughest high angle, high RPM applications. 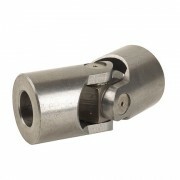 Precision machining, hardened yokes and matched fitting of all components means that it normally provides at least twice the life of a standard industrial type universal joint. It is available unassembled with no bore, or assembled with a pilot bore. Protective rubber boots are available to ensure proper lubrication for up to five times longer universal joint life. D’ Type universal joints are available in stainless steel. For use when contact with corrosive chemicals, exposure to corrosive atmosphere, or sanitation requirements are a factor. It is available unassembled with no bore, or assembled with a pilot bore. Protective rubber boots are available to ensure proper lubrication for up to five times longer universal joint life. These economical universal joints have an offset pin design. They are ideal for use on hand operated, low torque drives such as remote control linkages, awning devices, and much more. Capable of operating angles up to 45°.